11 different locations, 6 different photo stops, and the only tour that includes a visit to Alcatraz. A comprehensive city tour featuring our favorite neighborhoods in San Francisco. A full hour walking around the majestic Muir Woods National Monument. Learn the culture, history, and architecture along with great restaurant recommendations from a local guide. We’ll meet you outside Fisherman’s Wharf at our designated location at 9am. After a brief roll call, we’ll board the minibus and travel to our first stop. Over the next 7 hours you’ll be treated to stories about the neighborhoods, diversity, and geography of the area. We will exit the bus at several stops for photo opportunities and exploration, enjoying lunch in Sausalito and then spending over an hour in beautiful Muir Woods Redwood National Monument. In the afternoon you will be dropped off at Pier 33 for the official Alcatraz audio tour, returning to Pier 33 at approximately 6PM. This is where the tour will officially end. Escape the tourist areas as our local guides share the history and adventure of this amazing city. Used as a federal prison between 1933-1966, Alcatraz housed some of the most dangerous criminals of the time, including Al Capone, James "Whitey" Bulger and George "Machine Gun" Kelly. 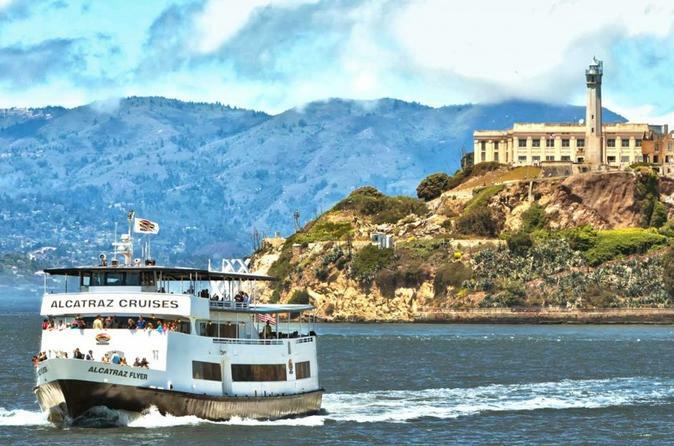 Featuring unbelievable views of the San Francisco peninsula, a visit to the island is essential when in town. Muir Woods National Monument is home to some of the oldest and most beautiful trees in the world. Features gorgeous walking trails and striking scenery. One of San Francisco's most popular destinations - from beautiful old shipyards, to the sea lions of Pier 39, Fisherman's Wharf has it all. Located just beneath the Golden Gate Bridge, Fort Point gives you a front row seat to the San Francisco Bay. Voted as one of the USA's "ten great neighborhoods", North Beach is best known as the home of Little Italy. From delicious restaurants to authentic sidewalk cafes and bakeries, you will feel the charm of San Francisco as soon as you arrive.